The holiday season is the most difficult time of the year to be on a diet. 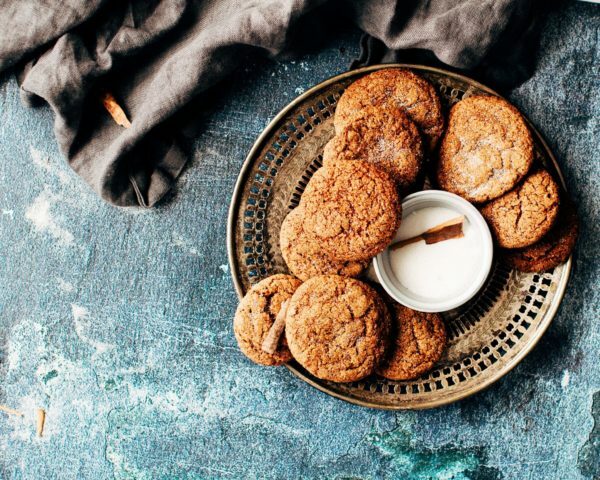 The world is full of rich, gluten-filled treats, and your grandma's holiday specialty probably goes against everything your new eating habits allow. How do you make it through all those holiday dinners without going into a gluten-coma or eating so much sugar you’ll spend the next year on a glycemic rollercoaster? Worse yet, if you’re hosting a holiday party, how do you create a menu that is diet-friendly for all the people in your life that are choosing to stray away from the traditional holiday habits? Here are three delicious holiday recipes that are diet-friendly and delicious for everyone to share! I love to bake and when I found this recipe I literally fist pumped. Bacon grease cookies? Uh, yes please! I whipped up a batch and brought it into the office for the Annmarie Skin Care team to try it out. The judgement: the cookies are super rich and they melt in your mouth. The bacon flavor is definitely prominent but it isn’t overpowering to the cookie. We think that a little bit of Aztec Sea Salt on top would be a nice touch. In a large mixing bowl combine the coconut flour, baking soda, cinnamon, ginger, and nutmeg together. When I use coconut flour, I like to dry-blend it with a hand mixer. Slowly add dry ingredients to the bacon/molasses mixture while mixing. Refrigerate the dough for several hours. Using a tablespoon scoop the dough and roll into balls and place on a parchment lined baking sheet. Bake for 12-17 minutes or until dark brown. I’ll just go ahead and say it. This bread really is life changing. An herbalist friend of mine brought it camping and it was so delicious that I had to ask for the recipe to include it for you all! Not only does it taste amazing, it’s packed full of seeds and nuts, so it’s a complete protein all by itself! It’s great for camping because it holds together wonderfully and it’s a gluten-free alternative to a lot of gluten-full granola bars! Eat it plain or lather it with cranberry sauce (that’s what I’m partial to) – it’s the perfect nutrient delivery device! The original recipe comes from My New Roots and there is a lovely Q&A about the ingredients and making it raw at the end of the recipe! Here’s the recipe that my friend makes. In a flexible, silicon loaf pan combine all dry ingredients, stirring well. In a separate bowl, whisk maple syrup, oil and water together. Add the wet ingredients to the dry ingredients and mix very well until everything is completely soaked and dough becomes very thick (if the dough is too thick to stir, add one or two teaspoons of water until the dough is manageable). I love hot chocolate. The smell of the delicious molten liquid incites memories of my childhood and the warmth of my grandmother’s house in the cold Michigan winters. Every morning we would run downstairs and the milk would be hot for our cocoa and the bread she had made the day before would be cut up and in the toaster oven. We would chat about how we slept and the dreams we had while we dipped our toast in the creamy cocoa, then we would get dressed and play for hours in the snow-covered forest. Those snowy winters are some of my favorite childhood memories, so as the weather started to change this year, I decided that I wanted to make the perfect hot chocolate. We don’t keep milk in the house anymore and a creamy cacao is harder to make than you might think, but this recipe has changed everything! 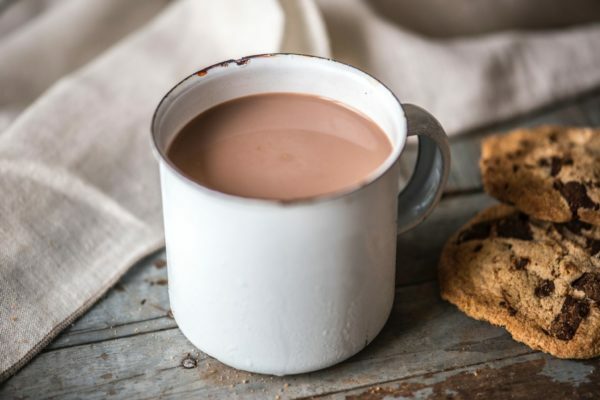 For an after-dinner snack this vegan hot chocolate is just about as perfect as it gets. Melt the coconut oil in a pan on the stove on low heat. Mix the cacao, ginger, cinnamon, and maple sugar in a small bowl. Poor the dry ingredients into the coconut oil and stir until the sugar is dissolved. Stir frequently until its warm and tasty! Let us know if you try these recipes or have any others you think we should know about! I’m making the cookies now and I noticed in the ingredients it lists 1/2C honey but in the instructions it says to mix “the maple syrup” with the other wet ingredients. Which ingredient is correct? Honey or maple syrup? I hope honey because tahrs what I used! Thank you for these wonderful recipes! I especially like the Bacon/Ginger cookies (we call them ‘biscuits’ in NZ) I source beautiful free range organic bacon. It’s great to find interesting wheat free recipes. Thank you for all that you do. Lighten up Deborah, it’s Christmas. 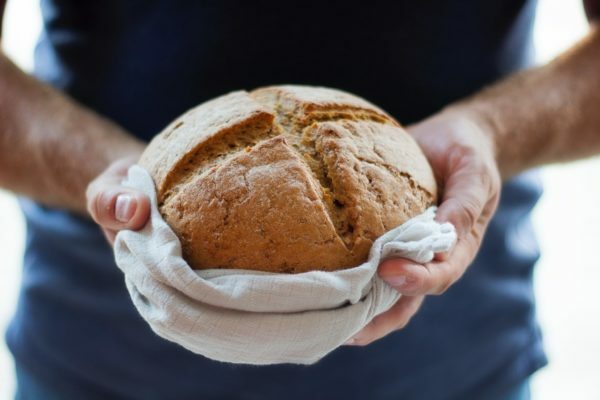 Have this bread recipe and love it. I do suggest that if you are using a regular medium loaf pan, non-stick or otherwise, to spray it with coconut oil before adding the ingredients, and taking a knife and loosening around the edges before baking, otherwise it will stick. Have tried with pan and parchment as well, still sprayed and worked fine. I do slice then freeze in single or double slices only as these are very filling yummy slices. Try toasted with raw honey, cinnamon or apple slices and nut butter. Trying your cocoa, sounds fantastic. Thanks. I thought you and Kevin were vegan. Raw vegan at that. What’s with the bacon? I’m disappointed. It seems everyone goes back to abusing animals sooner or later. Except for those that go vegan for ethical reasons. Once you decide you will not harm animals you have no choice but to remain vegan. I have to say I’m really surprised. Your husband was such a die-hard raw foodist. ?? What gives? Why did you decide abusing animals is an OK thing to do? Thank you for your comment. Kevin and Annmarie’s diet has changed over the years. They have read and studied and experimented to find what really works for them. But they still advocate for a diet full of raw fruits and vegetables. Annmarie Skin Care is more than just Annmarie and Kevin. We are a team of 12 people with varying food habits. With that said, our team as a whole strives to be conscious of where our food comes from. We in no way advocate for eating animals that come from factory farms and abusive upbringings. We recognize that most meat production is done in a way that is not respectful to the animal. When buying meat, we choose farms that care about their animals and raise them in a way that reflects that. I know that for some people, eating meat of any kind is unacceptable, and I totally respect that viewpoint. As a skin care company, we pledge to be cruelty-free, and besides our honey products, we are vegan. What we produce is skin care, and thus that is where we focus our attention. Our blog is a reflection of our whole team, and some of us do eat meat. We also recognize that many of our customers eat meat, so we feel good about suggesting healthy and fun ways to incorporate meat into your diet. If someone does eat bacon, and then they read this post, they may be inclined to save their bacon fat instead of tossing it, so they can use it in this recipe.